“I want you to take every step of your life with excitement for where you are headed. And I want you to feel beautiful and confident as you do.” But how? When the enemy whispers lies that you are not smart enough, pretty enough, or rich enough? Or you are too dumb, too loud, too quiet, too thin, too fat, too much or not enough? What if you don’t have what it takes to be who you really want to be? 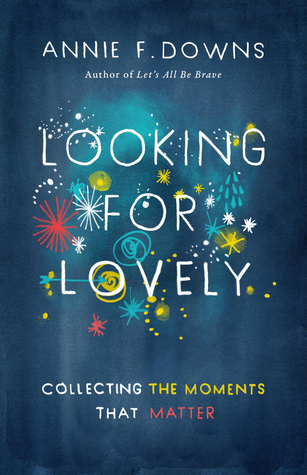 In Looking for Lovely, Annie F. Downs shares personal stories, biblical truth, and examples of how others have courageously walked the path God paved for their lives by remembering all God had done, loving what was right in front of them, and seeing God in the everyday—whether that be nature, friends, or the face they see in the mirror. Intensely personal, yet incredibly powerful, Looking for Lovely will spark transformative conversations and life changing patterns. No matter who we are and what path God has us on, we all need to look for lovely, fight to finish, and find beautiful in our every day! This was the right book for me at the right time. Annie Downs was a down-to-earth voice of reason and compassion. She recognizes that life isn't always easy, but that in every moment we have the opportunity to look for lovely - to find happiness and beauty all around us. Every so often I need to hear the message that God has plans for me. Bigger plans than I could ever imagine for myself. And he made for that purpose. Downs details her discovery of the beauty around her and her determination to find that beauty in the life she's living instead of the one she's waiting for. And she reads the audiobook, which is fabulous. I have decided that I would like to be her friend. She has an infectious laugh and her voice exudes kindness. And I maybe totally scoured the interwebs for more "life lessons from Annie". Some of her speaking engagements are on YouTube, and there is blog/podcast that I will be visiting regularly.